Ultimate security solutions for your home and business. With beginnings in 1976 and a tradition of quality, ABC Lock and Key is best known as New York City's premier locksmith provider of security and security solutions. 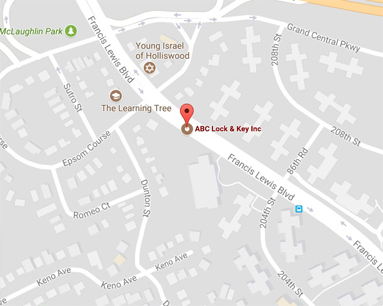 ABC Lock and Key is a local, family owned full service locksmith. We are not a call or dispatch center. When you call us, one of our friendly, trained professionals will be immediately on their way to assist you with a fully equipped service van and the expertise to address your needs. We serve and know our customers and we have always provided fair pricing and expert advice on residential, commercial and auto security solutions. 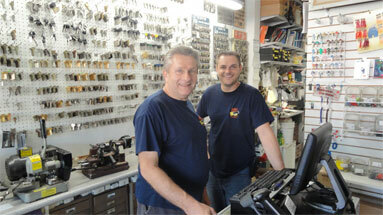 We pride ourselves on being able to help you solve any of your locksmith problems. We have the expertise and the know-how to help you get in or to keep others out. ABC Lock and Key invites you into our store for the friendliest, fastest and most knowledgeable locksmith services and name-brand products available in New York City. Contact us or visit our store location for all your locksmith needs. Locksmith Services and Proudly Serving: Eastern Queens, Bayside, Douglaston, Flushing, Fresh Meadows, Little Neck, Oakdale Gardens, Springfield Gardens and Whitestone and the Western Nassau communities with fast, friendly, professional and reliable skills.